This offering on the Red Rock River is located down river from Lima, Montana and encompasses 29.4± acres with the Red Rock River acting as the eastern boundary for approximately .4± mile and additional irrigation canals flowing through the ranch creating a wonderful setting. The property offers a variety of recreational amenities which includes excellent fishing for brown and rainbow trout, waterfowl hunting in the fall, as well as opportunities to hunt whitetail deer. A beautiful home and a spacious barn create the perfect compound which is wonderfully positioned into the landscape. The home sits overlooking the irrigated fields to the west with beautiful views of the Tendoy and Lima Peaks beyond while the Red Rock River lies to the east. Certainly, a great opportunity to own river frontage on one of Montana’s most private and coveted trout rivers. 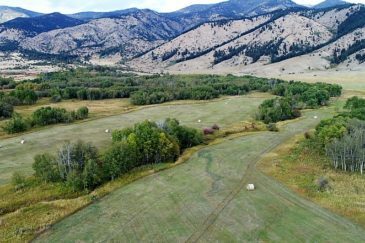 The property is in the heart of some of Montana’s best and most productive farm land and is surrounded by a variety of wildlife, proximity to excellent fishing, unlimited recreation including hiking, horseback riding, backpacking, camping, hunting and more. The wind turbines on the property are part of the 210-megawatt Glacier Wind Farm, Phase I and II.